Once the Roman ambassadors issue Lucius’ demand for “truage”in the great hall of Winchester, Arthur becomes enraged. After quickly conferring with his knights, he sends the Emperour’s emissaries packing. But first the young king recounts how he has read the “cronycles of this londe” in which (drawing on Geoffrey of Monmouth here again) the Breton kings, Belinus and Brennius, conquered Rome before Julius Caesar even thought about invading Britain. Further, Arthur recalls that “Constantyne oure kynnesman conquered hit.” Meaning Rome. So, no, Arthur is not going to pay any taxes to Rome. He declares his intent to marshal “ferse men of armys,” and to claim Rome for England. The Roman War episode then follows the elderly ambassadors’ rushed journey out of England as well as the Roman Emperour Lucius’ massing of an army–suspiciously filled with Eastern allies from places such as “Arabé” and “Turké.” The Roman army marches out of Italy to meet Arthur on the plains of Burgundy. As the text says, “Now leve we Sir Lucius and speke we of Kyng Arthure.” Arthur declares that he will hold a parliament in York, “aftir the utas of Seynte Hyllary,” to determine a course of action. Utas? 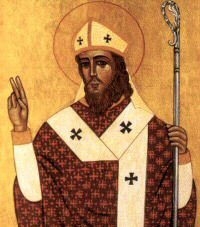 The term “utas” refers to the eighth day after a feast day (an octave), and, as St. Hilary’s feast day is January 13th, this means the parliament is to be held in York on January 21st. While much of Le Morte Darthur is set in a hazy, unspecified ‘romance’ time, Malory often brings in a kind of realism both in terms of time and geography, especially when drawing upon ‘historical’ chronicle sources for his material. By the mid-fifteenth century, ideas about geography were undergoing a significant change and nowhere is this more apparent than in the tale of the Roman War campaign. This has been a focus for my own work on Malory for much of the past five years. So in the tale of Arthur’s Roman War campaign, it is early January and by the end of January–the utas of Seynte Hyllary–Arthur will hold a parliament in York, almost 250 miles due north of Winchester. In going to Winchester, I had inadvertantly begun to follow the itinerary of the Roman War campaign: I was already in London and would be heading acrsoss the Channel to Rennes, France for the 2008 International Arthurian Congress, generally mirroring Arthur’s fictional journey. York was not exactly “on the way,” but I decided to follow the itinerary more consciously and, though it was not the Utas of Saint Hilary, the next day I purchased a train ticket to York.